Theda Mae Peterson, age 80, a long-time resident of Mountain Home, passed away peacefully on February 25, 2019 at home. Theda was born in Panguitch, Utah, to George E. and Grace (Cooper) Young. She had four siblings she adored. On January 5, 1957, she married the love of her life, Lester J. Peterson, while he was on leave from the Navy. For over 62 years, they did so much together - raising their four children, square dancing, mining for gold, camping, fishing, gathering and roasting pine nuts, crafting, teaching jewelry making classes, yard selling, and many other things too numerous to mention. Theda was extremely talented and worked hard her entire life. Theda worked for Denny’s, Desert Inn, The Merc, and Big Sky Oil. 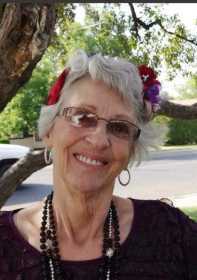 She was a Mary Kay consultant, raised tropical fish she sold to pet stores in Boise, beautiful African violets she sold to stores in town, raised exotic birds, made jewelry, beaded, painted, knit, sewed, gardened, canned, cooked, etc. She loved electronics and enjoyed sharing that knowledge with her children and friends. Theda was beautiful, smart, a mentor, confidant, and fighter. When life tried to knock her down, she would fight back, never quitting or giving up. She is an inspiration to those who knew her and will be greatly missed. Theda is survived by her husband Lester; her children Denzil S. (Margaret) Boyter, Ralph E. (Robyn) Peterson, Grace Machelle (Rick) Poole, Sherri J. (Bruce) Durand; and numerous grand and great-grandchildren. She is preceded in death by her parents and her two brothers James N. Young and Warren G. Young. She will be laid to rest at 10:30AM, on March 25, 2019 at Mountain View Cemetery in Mountain Home. Cremation was under the care of Rost Funeral Home.